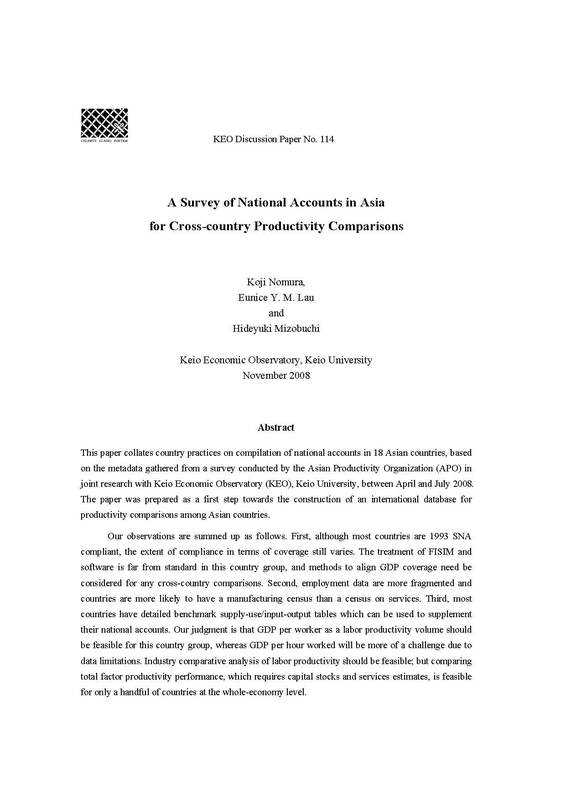 名前 Lau, Eunice Y. M.
This paper collates country practices on compilation of national accounts in 18 Asian countries, based on the metadata gathered from a survey conducted by the Asian Productivity Organization (APO) in joint research with Keio Economic Observatory (KEO), Keio University, between April and July 2008. The paper was prepared as a first step towards the construction of an international database for productivity comparisons among Asian countries. Our observations are summed up as follows. First, although most countries are 1993 SNA compliant, the extent of compliance in terms of coverage still varies. The treatment of FISIM and software is far from standard in this country group, and methods to align GDP coverage need be considered for any cross-country comparisons. Second, employment data are more fragmented and countries are more likely to have a manufacturing census than a census on services. Third, most countries have detailed benchmark supply-use/input-output tables which can be used to supplement their national accounts. Our judgment is that GDP per worker as a labor productivity volume should be feasible for this country group, whereas GDP per hour worked will be more of a challenge due to data limitations. Industry comparative analysis of labor productivity should be feasible; but comparing total factor productivity performance, which requires capital stocks and services estimates, is feasible for only a handful of countries at the whole-economy level.